You’ve had a long and tiring day at work/school/college/playground etc. and all you want to do is go home and tumble into bed. Imagine how tired your heart must be! Yes, your heart, the organ who continuously pumps blood through your body and helps you work/play/walk/rest – it basically helps you live! You may be surprised to know that your tiny little heart has been working and pumping blood long before you were even born!! Your heart began beating barely 18-21 days after you were conceived. Your tiny little heartbeat lets your parents know of your existence in the womb. Since then, your heart has been relentlessly working, and mind you, it doesn’t allow itself any power naps in between! We know that our bodies are made of skin, bones, cartilages, tendons etc. Have you ever wondered which of these substances makes up your heart? Your heart is a muscle, but not just an ordinary muscle like your biceps or triceps. The heart is the hardest working muscle in the body, working 24/7 until life ceases. It has no bones, only sheets of muscle fibers arranged over a fibrous skeleton to give the heart chambers their shape. The heart is located roughly in the center of the chest cavity and is approximately the size of your fist. The heart beats about 72-80 times a minute, or 115,000 times every day! If you were to live to 70 years of age, your heart would beat more than 2.5 billion times. The adult heart is conical in shape and measures about 12 cm. in length, and 8 to 9 cm. in breadth at the broadest part. In males, it weighs slightly more than in females and ranges from 280 to 340 grams, whereas in females, it ranges from 230 to 280 grams. What does the heart look like from the inside? The two atria are thin-walled structures separated into right and left halves by a septum running between them called the interatrial septum. The two ventricles are relatively thick-walled and separated by the interventricular septum running between them. One major circulatory vessel, either an artery or a vein, enters or leaves each chamber of the heart, thereby helping in the transport of blood. The flow of blood throughout the heart is controlled by a one-way valve system, which is extremely necessary to prevent the backflow of blood from the chambers. The valve present between the right atrium and the right ventricle is called the tricuspid valve; a similar valve present on the left side is called the mitral valve. Right atrium – Blood that has been circulating in the body becomes depleted of oxygen and comes to the right atrium via two vessels called the superior and inferior vena cava. From the right atrium, blood flows to the right ventricle through the tricuspid valve. This valve allows the blood to flow only from the right atrium to the right ventricle, but not vice-versa. Right ventricle – The blood in this chamber is then pumped out of the heart to the lungs through the pulmonary artery where the blood gains oxygen once again and is sent back to the heart. 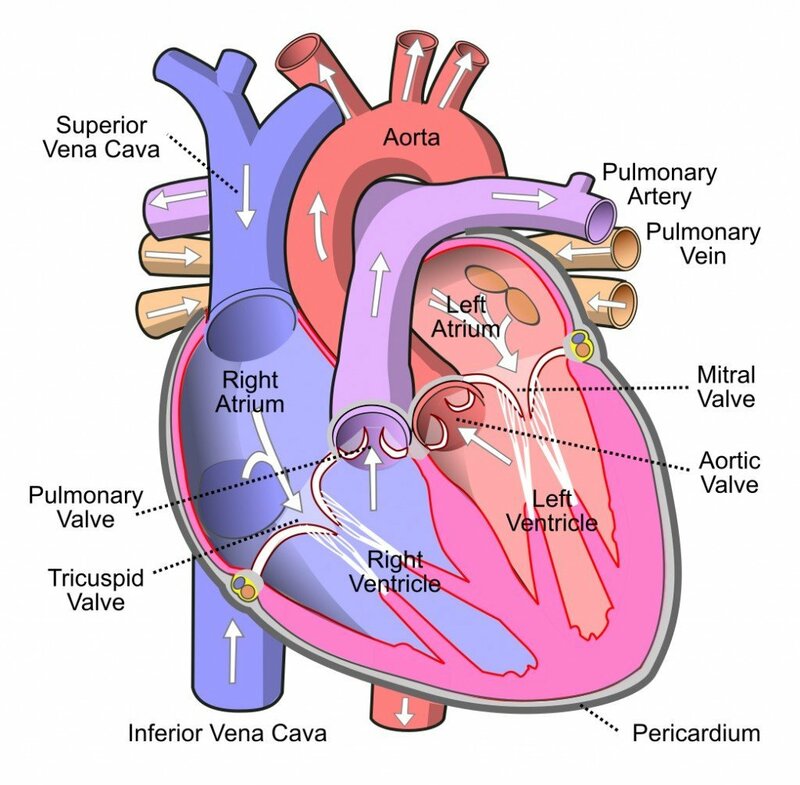 The entry into the pulmonary artery is controlled by a valve called the pulmonary valve. Left atrium – This chamber now receives the blood that has gained oxygen from the lungs and is now oxygenated. The blood is brought in by the pulmonary veins. From the left atrium, the blood enters the left ventricle through the mitral valve, which also only allows unidirectional flow from the atrium to the ventricle. Left ventricle – This chamber of the heart is now filled with oxygen-rich blood, which can be used by the various tissues across the body. This oxygenated blood is sent into systemic circulation by the aorta and is controlled by the aortic valve. Systemic Circulation – The left side of the heart pumps good blood into a vessel called the aorta, which then supplies blood to all the systems of the body. Pulmonary Circulation – The right side of the heart pumps bad blood into the pulmonary arteries, where it eventually goes to the lungs to pick up oxygen and finally returns to the heart. Why does our heart go LUB-DUB-LUB-DUB? Our heart beats approximately 60-80 beats/min (average of 72 beats/min); each time it beats it makes a sound similar to LUB-DUB and between each LUB and DUB of the heart, the heart pumps blood through our circulatory system. Ever wondered where those sounds come from?? Well, the valves that we spoke about earlier namely the tricuspid, mitral, pulmonary and aortic valves are the ones responsible for these sounds. When the tricuspid and mitral valve close between their respective atriums and ventricle, the sound LUB is produced; each time the pulmonary and aortic valves shut to prevent backflow to the ventricles, the sound DUB is produced. Now, sure enough, these valves don’t shut as loudly as you slam your bedroom door, but the LUB-DUB sounds can definitely be heard when you hear the recorded sound of a heartbeat, or press your ear to someone else’s chest! We must understand that this is not everything when it comes to the functioning of the heart. Apart from this basic structure, there exists a blood supply, a conduction system etc. that goes beyond the scope of this article, but it’s safe to assume that for a fully functioning heart to exist, we need all these things to be working in a synchronized manner around the clock, all the time! Any aberration in either the blood vessels of the heart or the conduction system leads to various heart conditions and diseases that make it difficult for the heart to perform its duty of circulating blood and keeping us alive.